Closing out a popular series, the Perth Mint of Australia has issued the 2016 Loki 2 oz Silver High Relief Antiqued Coin. 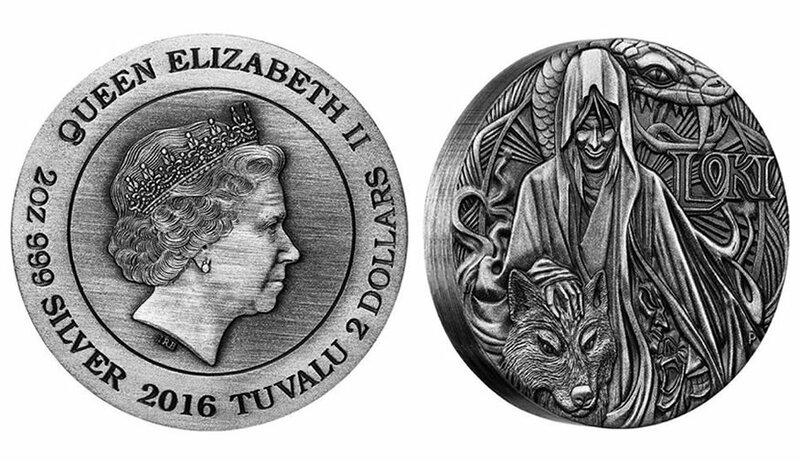 The Loki coin marks an end to the Norse Gods Three-Coin Series, the first two of which sold out. Each is composed of two ounces of 99.9% pure silver, carries an antique finish, is in high relief, and features a rimless format. Appearing on the new coin’s reverse (tails side) is a design depicting the mythical Norse god Loki, wearing a cloak with smoking edges. The wolf Fenrir and the serpent Jormungand are to the left and right. The design also includes three masks representing the many forms Loki takes on as a shape shifter. Completing the scene are the inscriptions of LOKI and the Perth Mint’s ‘P’ mintmark. These coins are legal tender of the island nation of Tuvalu and depict Ian Rank-Broadley’s portrait of Queen Elizabeth II on their obverse (heads side). Inscriptions include QUEEN ELIZABETH II, the face value of 2 DOLLARS, the issue year of 2016, TUVALU and the composition of 2 OZ 999 SILVER. Earlier Norse Gods coins depict Odin and Thor. Both sold out as did similar coins showcasing Gods and Goddesses of Olympus. Minimum gross weight of each coin is 62.27 grams with a maximum diameter of 40.50 mm and a maximum thickness of 6.00 mm. Order the Loki coin directly from the Perth Mint of Australia via our affiliate link to perthmint.com.au. Current pricing is AUS $180.91 (~US $138.68), while the limited mintage of 2,000 remains. Each coin ships with a wooden display case featuring engraved detailing on its lid. A themed shipper and numbered certificate of authenticity are also included. This series has been popular for sure, but the Thor coin did not sell out quickly as stated in this article. The current Loki coin has been available for a week now without a sellout & is even available from some official distributors for a few dollars less & less S&H than directly from the Perth Mint of Western Australia government (Gold Corp. owns this Mint – not to be confused with the Royal Australian Mint which is the official Mint of Australia). CoinNews does not cover the Royal Australian Mint numismatic program coins for some reason.